To allow use of simple but scalable API, I propose an organization based on abstract classes. This separation should allow to modify the treatments for various processing blocks. Before detailing the proposed implementation, we must try to identify the different needs and constraints. Manage one or several cameras (I mean physical device) in a sequence (stereovision, single camera, multivision...). Each camera can be of different type (Fisheye, with/without radial distortion, various intra-parameters...). This GSoC will try to produce an high-quality dense 3D reconstruction for rigid models. 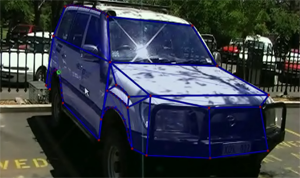 Sub-pixels points detections, robust transformations estimations and sub-pixel dense displacement computation will be implemented into an efficient and scalable API. For now, a few resources are available but I hope with time this will grow ! Check for new version of the API using Google code. Read and update wiki's pages.